Learn French Online – What is Babelzone? Here at LCF Clubs we pride ourselves in addressing the needs of language teachers and learners alike. BABELZONE is an online collection packed with hundreds of stories, animated songs, games and printable activities organised in clear and practical units. Our aim is to make your learning or your teaching an enjoyable experience. Primarily created for use in our after-school French and Spanish clubs, Babelzone is now used in classrooms across the UK and around the world. Learning any new language can be a daunting task, but with Babelzone we wanted to give learners the ability to learn French online in a fun and enjoyable way. The activities in Babelzone are short, simple and funny, allowing children to quickly pick up phrases or vocabulary without much difficulty. Babelzone uses ‘gamification’ to engage users, so that learning is fun and rewarding. Babelzone is very suited for ‘flipped classroom’ lessons and ‘blended learning’ because students are able to access the site from home as well as at school. Animated conversations, and question/answer format discussions. Usually with a variety of characters and responses, with play and pause buttons for ease of use. A mixture of traditional songs, and new original music. 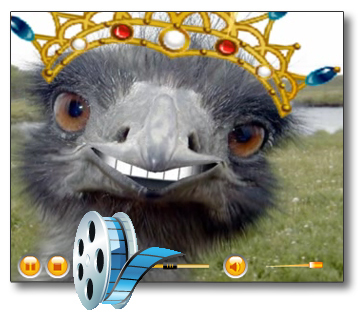 Catchy tunes with quirky animations, our songs are designed to stick in your head! Each animation has text shown (text can be hidden in some songs). Lyrics for each song can also be downloaded as a PDF file. Some traditional well known stories (for example The Three Little Pigs / Les trois petits cochons) and some new hand-crafted tales, each one animated with our unique sense of humour. Companion activities are available for most stories. Stories are a great resource for introducing new vocabulary whilst showing context. Clickable animations and activities show pictures of new vocabulary for each thematic section. Pictures are accompanied by spoken words and text. Each game is linked to a story, song or dialogue. There are many different types of games, some are suitable for use on an interactive whiteboard for whole class activities, some are more suited to individual learners. Examples of some types of games: matching pairs, naughts & crosses, drag and drop, and memory games. Juniorzone contains flashcards and online activities that be used for speaking activities and inspiring conversation. Flashcards, displays, labelling activities and many others. Using different formats quizzes and tests are important for assessment. Our tests contain a mixture of listening, reading and writing. The quizzes are in many different formats, multiple choice, gap fill, drag and drop, memory games. Transcripts of dialogues, lyrics for songs, worksheets to complement the activities. Downloadable MP3 files of dialogues. Spoken by native speakers. Juniorzone – aimed at secondary level learners, with intermediate level French. After you have explored what you can find in each section of Babelzone, why not apply for a free trial? In the ‘Pour les petits’ section of Babelzone you can find activities for very young children (approximately ages 3-5). The activities are bright, fun, simple and engaging. Aimed at children who are using Babelzone as a supplement to the ‘Les tout petits’ clubs or lessons at school. In ‘Pour les petits’ parents will be able to find a variety of activities that they can use to help their children learn French online. ‘Pour les petits’ is organised into activity areas: Stories, Songs, Games, Activities to print, and French soundbites. Il y a un monstre sous mon lit! and how she scares him away. the names of parts of the body. do the actions as well! Which hat belongs to ‘le magicien’? Babelzone for teaching French to KS1 and KS2 is organised into 26 topic units, based around the original MFL QDCA scheme of work for Modern Foreign Languages from 2009. 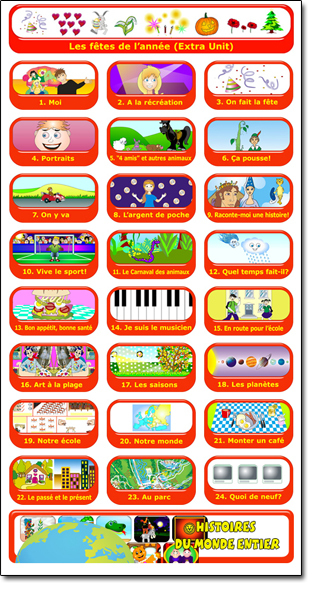 Each of these units contains songs, stories, games, printable workhseets, phonics and MP3 downloads for children to learn French online. Moi (All about me) – Learn how to describe yourself, your family and others. 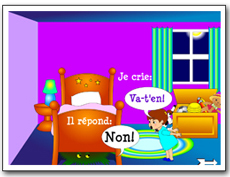 An introduction to simple phrases such as ‘Comment ça va?’. A la récréation (Songs and Games) – Using simple songs to learn numbers and play familiar games. 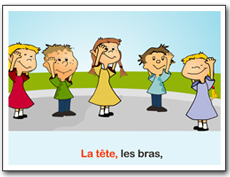 On fait la fête (Celebrations) – Learning about celebrations and special occasions. Portraits – Learning about the names for the main parts of the human body, and also colours. “4 amis” et autres animaux (The “four friends” and other animals) – Children learn to talk about and describe animals. The humorous story ‘Les musiciens de Brême’ can be found in this unit along with other activities. Ça pousse! (Growing things) – This unit is about vegetables and plants. You can read the story of Jack and the Beanstalk in this unit. On y va (All aboard) – Learn about travel and days of the week. Meet ‘Henri l’espion’ in this unit. L’argent de poche (Pocket money) – Children learn about numbers, money and discover what they could buy with their pocket money. Raconte-moi une histoire! (Tell me a story) – This unit teachers about sounds and spellings using popular stories such as ‘La Belle au bois dormant’ (Sleeping Beauty), ‘Boucles d’or’ (Goldilocks) and others. Vive le sport! (Sport) – Learn about sport and game vocabulary. Play a game with football shirts and revise numbers. Le Carnaval des animaux (The Carnival of Animals) – Children learn about how to describe animal characteristics, and also how to tell the time. Quel temps fait-il? (What’s the weather like?) – This unit is about describing weather, seasons, and clothing. Bonne appétit, bonne santé (Good appetite, good health) – Children learn some food and health vocabulary, and learn about Bastille Day . Sing along to ‘Chez le Docteur’! Je suis le musicien (I am the musician) – Children learn about the names of different instruments, and practice talking about the types of music they like. Sing along to ‘Nous formons une équipe’ among many other activities. En route pour l’école – Children learn about the alphabet, numbers and directions. Art à la plage – This unit is about art and holidays. Children learn about some famous French artists, and there are some artistic activities as well! Les saisons – This unit is about the four seasons. Children learn how to describe each season using songs, poems and stories. Les planètes – Children learn the names of the planets and revise time, months and days of the week. Notre école – This unit contains revision of time and routine, and children can learn the names of rooms in a school. Notre monde – This unit is for learning about places and cultures around the world. Learn how French people say the different countries in Europe, and watch some stories from other cultures, such as ‘Anansi l’araignée’ (Afrique de l’ouest et Jamaique). 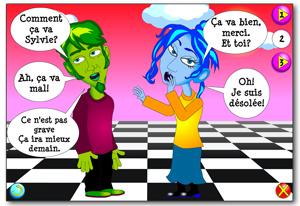 Monter un café – In this unit children learn about ordering food in a café. You can even watch a play by one of our French clubs, ‘Au café’. Le passé et le présent – This unit focuses on learning how to compare the past and the present, with some revision of places. Au parc – This unit contains revision of time and numbers up to 100, with activities and presentations about games and travel. Quoi de neuf? – Learning about vocab from news articles, time, emergencies, and dates. Histoires du monde entier – A special unit containing stories from around the world, researched and collated by our detective ‘Henri’ and his sidekick ‘Max’. A ‘Surival kit’ containing basic greetings and dialogues in French for example, starting with ‘Salut! Bonjour Sylvie!’ and going through other basic areas like numbers 1-100, spelling names, writing phone numbers, telephone greetings and more. This unit contains activities about the world and cultures. Here you can find many animated stories from around the world, spoken by a French native. Each story also has complementary activities such as flashcards or games. For example, ‘Anansi’ a traditional African story, is accompanied by a vocabulary structure sheet (verbs and adjectives) and a PDF transcript. A unit containing activities about food and eating out. For example, you can listen to dialogues in a French restaurant, play the song ‘A gla gla’ and then do the ‘complete the text’ activity about the same song. Plus, learn about ‘healthy eating’ in French, and many more activities. Learn about high school life in this unit. Sing along to ‘Chanson l’ordinateur’ and learn details about ‘Le lycée Viviane-du-lac’, among other activities. This unit is full of activities about the city, the country, and the environment. Among the activities in this unit are: Follow directions in French to get to Sabine, Roger, and Pierre’s homes, learn about the Paris metro, and listen to a poem called ‘L’arbre’ by J. Charpentrau. Here you can find activities about sports, leisure and hobbies in French. Find out which television programs animals like to watch, see ‘DJ Kevin’ in action and read about teen magazines in France, and many more. This unit contains activities about holidays. Amongst the many activities on offer here are ‘Où vas-tu Basile?’ a song about monsters, and where they are going. Follow the picture/text/spoken word journal for ‘En route pour la France’, and practise past/present/future tenses when describing holidays. In this unit you can learn French online with activities that are themed about work, shopping and community. You can find dialogues between customers and shop assistants in this unit; as well as a song about Marie-Madeleine, who finds that her shopping list is too expensive. This unit is where you go if you want to learn online about French celebrations. You can sing along to ‘Toute une année’ and learn about ‘La fête du travail’, among other activities. This unit has been created for those who wish to combine study of another subject whilst learning French online. There are activities in this unit for Litérature / Poésie, Mathématiques, Histoire, Géographie, Art, Sciences, and Musique. 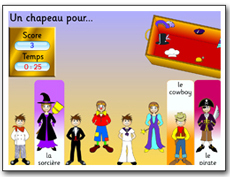 As well as the themed units described above, Juniorzone French also contains units focusing on ‘Grammaire’ and ‘Phonetique’. We are also arranging our activities into units based on the activity itself, such as ‘Chansons’, ‘Histoires et dialogues’, ‘Vocabulaire’ and ‘Tests’. If you would like to try before you buy please apply now. We hope you enjoy using Babelzone as much as we enjoy making it!